My first year, just like mostly every new teacher, was sooooooo hard. Mostly because I didn’t know what to expect. These are tips that would have helped me when I was beginning my first year of school. Expect to be overwhelmed. Teaching is such a big job. You only find out how big those shoes are once you step into them. Expect to feel out of sorts. Even if you have experience student teaching, being in charge is a horse of a different color. This is a new experience. Any new experience can make you feel this way. Expect to feel overwhelmed. Teaching is such a big responsibility. Until you assume control over a class, you never know just how overwhelming it is. You never know just how many lesson plans there are to make, change, and implement; how to decorate the classroom; how to take advantage of a teachable moment @ any point and time. It’s so much I can’t list them all. Try to stay on top of the lesson plans. Be very diligent with keeping up with the lesson plans. Your day becomes a lot longer when there’s nothing to do. Hopefully, you’re not in school. If so, good luck with that. Don’t expect a lot of support. If you have it fine, if not fine. Fellow teachers will be your biggest supporters. Find out who the biggest, baddest teacher is and arrange to have your students spend their time-out there. Don’t expect everything to be easy. If they are, super-dee-duper-fantastic. If not, welcome to the real world. Expect the students to challenge you. Believe me when I say they will. They have to. Expect to want to quit at least once a week, maybe more. Finally, expect a steep learning curve. Being the teacher of record is totally different from student teaching. It is so much more to it. I don’t care how prepared you think you are, there’s always more to learn. The last episode aired Friday, August 28, 2009 on PBS. It’s the end of an era. Reading Rainbow is gone. Reading Rainbow aired from 1983-2009, with the last original episodes being taped in 2006. The winner of a Peabody award and 26 Emmy awards, ten of which were in the “Outstanding Children’s Series” category. It was the third longest running program on PBS, after Mr. Roger’s Neighborhood & Sesame Street. It was the home of fantastic book reviews by kids for kids, the celebrity guests reading greatly beloved stories, and LeVar Burton’s melodic voice telling viewers “But you don’t have to take my word for it,” & “I’ll see you next time.”…ALL GONE. Why is it gone. It’s gone because PBS decided that it was in children’s best interest to teach them how to read instead of teaching them how to love reading. That’s what Reading Rainbow did. It taught the love of reading. What do you think dear readers? Was that a good choice that PBS made? I say no, no, no…a thousand times no. There are many shows that teach children how to read. However, Reading Rainbow was the after. What happens after someone learns to read? Once a child learns to read, will they continue to do it? or Will it fall by the wayside like so many forgotten hobbies? Reading Rainbow made a big difference in my children’s lives and the lives of countless others. I’d like to know where I can catch old episodes in reruns or on DVD. I am not ready to say good-bye to Reading Rainbow just yet. Once again, shame on you PBS! Anyone signed up for A.P.L.E. will be happy to hear this news regarding A.P.L.E. payments. Someone just left a comment on my page regarding payment. They finally got it. I’m happy to hear that. I was starting to get nervous because I will start getting payments next year. I was beginning to think I wouldn’t. I’m happy to hear that people are getting their money. That means $19,000 for me. Thank God. I cannot believe this heat. It is too hot. I am sitting under the fan. I want to turn on my air conditioner, but don’t want to see the bill. Last time, it was over $500, when it’s usually about $350. For now, the fan’s good enough. I can’t even imagine being up in La Cañada with the fires. That is not a good situation! My prayers are with those people up there. Happy 1,000th Post To Me! Yes, dear readers, as the title states, I am celebrating my 1,000th post. It has taken me a little more than two years to reach this milestone, but I’ve finally done it. So, Happy 1,000th post to me! Just thought I’d share this. Even though this list is 4 years old, it’s still the list I choose from. Enjoy! Here is a complete list of my pick of 25 books to read the first few weeks of school. Enjoy! Here is the end of the list. I read to my class everyday. I highly suggest that you read to yours everyday. Your students will greatly benefit from it. Roxaboxen, by Alice McLerran, is one of my favorite books ever. It celebrates one of my favorite subjects of imagination. This is the true story of the author’s mother and aunt’s play world in Yuma, AZ during the Depression. Money and toys were scarce, so they used their imagination and created a little town they called Roxaboxen, complete with a sheriff and a jail. This is the cutest little story. Read it. Your class will love it. A Fire Engine for Ruthie, by Lesléa Newman, is a must read, especially for little girls. I’d have to say this book is especially good for tomboys. The little girl in the book, Ruthie, goes to visit her grandma who has many activities all planned out for them; girly activities, that is. As it turns out, Ruthie isn’t interested in any of that. What Ruthie’s interested in are things that boys are traditionally interested in- fire trucks, silver ladders, blue trains, and a little red caboose and wheels that go chucka-chucka, chucka-chucka and a whistle that goes toot! toot! Although Nana doesn’t understand, she lets Ruthie be who she is. This book is about being true to yourself. Great story! Stephanie’s Ponytail, by Robert Munsch, is so funny. The first time I read this, I kept laughing. It’s so silly. And you know, if you’ve been reading my blog, that I love anything silly. Stephanie, the title character, loves her ponytail. But she doesn’t want it to be like anyone else’s. She asks her mom to put her ponytail on top of her head where it looks like a waterfall. Initially her mother protests, but she does it anyway. A little girl tells Stephanie it’s ugly, ugly, very ugly. However, the next day, when Stephanie comes to school, everyone has their hair like that. Even the teacher. The story continues like that, until Stephanie teaches them all a lesson about being themselves. Although this book is silly, it still has a clear message- Be yourself; don’t copy anyone. When I was little, I didn’t know what a family was. This is just a cute little book. There’s no real big message here. The kids may be able to identify with the little girl and they might get a chuckle or two out of it. I think it’s for adults more than children, but it’s still cute. 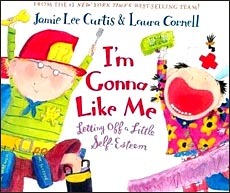 I’m Gonna Like Me (Letting off a little self-esteem), by Jamie Lee Curtis, is good for up to 5th grade. I read it to my students (that ranged in age from 7-12) and they still thought it was cute. Of course, as the title states, it’s about self-esteem. The little girl in the story tells about how she’s going to like herself when she jumps out of bed, when she grins, when she looses her teeth, etc.